Home › Alternative Fuels › RFS: Reconsidering Fuel Standards? The Renewable Fuel Standard (RFS) is a hotly contested issue in the U.S., and recent political wrangling may end up setting back progress that proponents of renewable fuels have made. The U.S. Environmental Protection Agency (EPA) appears to be walking back the planned increases in renewable fuels, particularly ethanol, that are required to be blended with traditional fossil fuels in 2014. In a recent Reuters article, EPA documents were cited as calling for 13 billion gallons of corn-based ethanol in 2014. This is less than the 13.8 billion gallons required in 2013 and far less than the 14.4 billion gallons that were originally required for 2014. While less renewable fuels could be burned in place of fossil fuels in 2014, there is a silver lining that environmentalists should be focusing on. Recent attempts to diversify the supply sources of liquid transport fuels, while well intentioned, have some unfortunate consequences. Corn-based ethanol production is widely debated as a driver of rising food prices. Admittedly, making fuels from feedstock that can also be food is a bit counterintuitive. 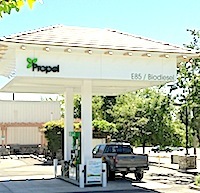 Proponents of biomass-based fuels see this as one of the key reasons that biomass-to-liquid (BTL) fuels should be the focus of renewable fuel policies. Unfortunately, BTL fuels are costly to make and depend on government policies to support their production. The EPA did not call for increased production of biomass based diesel (BBD) to make up for the downward revision of ethanol mandates, which a Biofuels Digest article suggests could be due to concerns that the $1 per gallon blenders’ tax credit for BBD may not be extended. While renewable fuels are an important piece of the fuel diversification puzzle, they may be getting too much attention. Fuel producers are resisting the push to blend increasing proportions of ethanol or bio-diesel into their fuel products due to concerns over liability if damage to vehicles occurs. Blends with over 10% ethanol or bio-diesel are thought to cause engine damage and as a result auto manufacturers will not approve their use. This means that there is a 10% “blend-wall” that will ultimately limit the amount of renewable fuels that the U.S. market can absorb. The possible revisions to 2014 renewable fuel standards are seen as a concession by the EPA that this barrier exists. The silver lining to the dark cloud growing over renewable fuels’ future is that alternative ways of displacing traditional fossil fuels exist. The news for alternative fuel sources is not all doom and gloom as some environmentalists suggest after hints of revision to the RFS. There may be a better way to promote the adoption of alternative fuels than the expensive subsidy programs and mandates currently keeping renewable fuels competitive. The alternative fuel looking increasingly attractive as a candidate for replacing fossil fuels is methanol. Methanol is a clean-burning alcohol that is getting a lot of attention for some very good reasons. A recent Wall Street Journal article laid out a compelling argument for why alternative fuel proponents should focus on this emerging transport fuel. The shale gas boom provides the U.S. with an opportunity to produce methanol inexpensively, while adding additional value to this newly accessible natural resource. Another benefit of switching to methanol is reduced emissions of a range of environmental pollutants, including CO2. The carbon recycling envisioned will not replace fossil fuels overnight. This is more of a long-term vision for sustainable transport, but switching to methanol-fueled transport does not present as many barriers to adoption as many renewable fuels. One of the major drawbacks of methanol is that it is not a suitable replacement for diesel, compression ignition, engines. Diesel engine vehicles dominate the heavy transport and marine shipping segment of the transport sector, so replacing diesel is an important part of fossil fuel displacement. Luckily, methanol can be easily processed into dimethyl ether (DME), which is an excellent replacement for dino-diesel fuel. DME is cleaner burning and actually has higher a cetane number (measure of fuel quality) than traditional diesel fuel. The prospect of price competitive (sans-subsidy) methanol and DME production from natural gas and CO2 feedstock should have transport sector observers excited. The transport sector contributes approximately 25% of global greenhouse gas emissions and the rate at which transport related emissions are increasing is rapid. As people in developing nations, especially India and China, put millions of new vehicles on the road, having economical alternative fuels to power these vehicles will be vital. If the transport sector is to ever reduce its contributions to global GHG emissions, alternative fuels will have to displace the fossil fuels our vehicles run on. Until convenient mass transit or the cheap electric or hydrogen fuel cell vehicles of tomorrow are widely used to move people and things, alternative fuels provide the best opportunity for meaningful reductions in transport sector emissions.